Express Business Analysis Only with New MetricsCube! Major changes require time and energy to deliver. But whenever we get down to transforming feedback collected from our clients into real-life solutions, we always think of it as an investment. An opportunity to assure our audience that the trust they placed in our pioneering tool has not been for nothing. Today we have the pleasure of shedding some light on our most recent developments that will hopefully make your experience with MetricsCube even more personalized, effortless, and time-effective. The entire skeleton of MetricsCube is based upon dynamically generated reports that, as of today, amount to 45 in total. These detailed statistics are the very window to the performance of your company and it just makes sense that you would like to be able to access the desired piece of information about your operations instantly, at all times. Therefore, to better handle the heaps of data flowing through your application in real time, we have readjusted various elements of the dashboard and as a result, boosted the loading of reports to a significant extent. Now you no longer need to worry that uploading more data will cause less smooth performance of MetricsCube. Why not have your cake and eat it too? Although no detail can slip your attention while keeping a sharp eye on your report statistics, sometimes it is a good idea to have also an overall view on the performance of your company as well. To this very end we have come up with an extra email notification that will be sent to you on a daily basis, summarizing how well your business performed across several areas the previous days. The recap will include the total number of acquired clients, placed orders, renewed services, or completed transactions. So next time you are stuck in traffic, or wait for your doctor’s appointment, pick up your phone and check up how your company is doing with a single glance! If you are trying to figure out how to get hold of our brand-new faculties, we are glad to assure that you do not have to do anything really. Well, except for logging in to your account and checking out every feature with closer care as the update is already live! 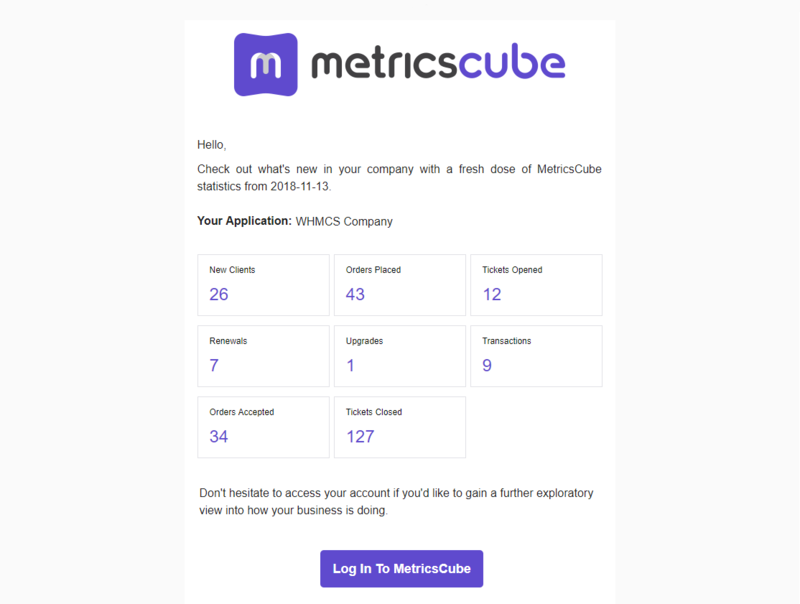 Have you discovered MetricsCube only recently and wonder if it will be a perfect fit your company? Feel welcome to give it a shot during a free 14-day trial and let us know what you think!